According to Statistics Finland’s preliminary data, prices went down by 1.3 per cent in Greater Helsinki and by 0.8 per cent in the rest of the country from September to October. In Helsinki and Oulu prices remained nearly unchanged. Prices went up by more than three per cent in Tampere and Turku. In Espoo prices went down by 3.7 per cent and in Vantaa by 2.3 per cent. Compared with the corresponding period of the year before, prices went up by three per cent in Greater Helsinki and fell by two per cent in the rest of Finland. Prices went up most in Tampere, by around seven per cent, and in Helsinki, by four per cent. 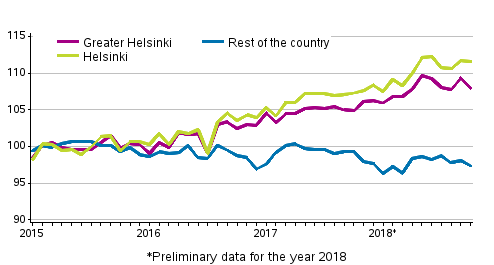 In October 2018, the average price per square metre of an old dwelling in a housing company was EUR 3,625 in Greater Helsinki and EUR 1,631 elsewhere in the country. In Helsinki the average price per square metre was EUR 4,195 and in Oulu EUR 1,801. According to data available to Statistics Finland, 48,217 transactions of old dwellings in housing companies were made in the whole country in January to October. The number of transactions was 13,895 in Greater Helsinki and 34,003 in the rest of Finland. In the corresponding period of last year, 48,992 transactions were recorded in the whole country. In Greater Helsinki, the number of transactions was 14,398 and in the rest of Finland 34,594. ISSN=2323-8801. October 2018. Helsinki: Statistics Finland [referred: 26.4.2019].